Fulham extended their unbeaten run in the Championship to six games with a hard-earned victory over Huddersfield. The home side survived early scares when Mark Hudson's header was cleared off the line and Harry Bunn shot wide. 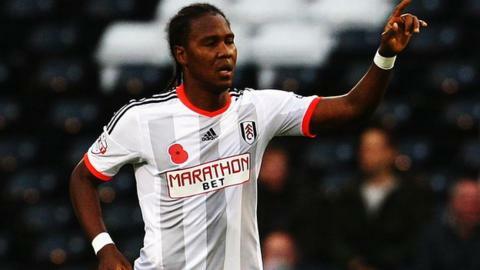 Hugo Rodallega capitalised for Fulham by finishing Scott Parker's pass. Joel Lynch's header levelled terms after the break but Lasse Vigen Christensen ran clear to re-establish the lead and Ross McCormack fired a stunning third from 25 yards. The points moved the Cottagers up to 17th and will please recently installed boss Kit Symons all the more as they arrived against a Huddersfield side who themselves had lost just once in nine games before kick-off. Symons - who took temporary charge in September - was awarded the role on a permanent basis in late October and his side look much improved to that which did not find a win in the opening eight games of the campaign under Felix Magath. They weathered early pressure in front of their own fans as after Elsad Zverotic had cleared Hudson's attempt from the line, Bunn had a strong penalty claim turned down before he fired wide when one on one. Rodallega punished the miss and gave the home side the lead, pouncing on McCormack's pass to coolly score his sixth goal of the campaign. Like Fulham, Huddersfield started the season badly but have found form and their resilience was clear to see early in the second half as they pressed to level. Bunn was denied a seventh goal of the season when Kostas Stafylidis pulled his shot off the goalline and Grant Holt missed a glaring opportunity - volleying over from inside the six-yard box. Huddersfield's reward for their pressure arrived when Lynch powered his header in, but parity was short lived as midfielder Christensen nut-megged Hudson and lifted the ball over the advancing Alex Smithies for a fine solo goal. Rodallega wasted a golden chance to kill off Huddersfield - shooting over late on - but McCormack's superb strike with six minutes to go clinched the win. "The top six is possible. It's a big ask where we come from but my aim is to improve every week. If we can do that then who knows where it will take you. "The league is wide open. For us to get up there we need to go on a good run which is a monumental task. "But I was caretaker when we started the run at Crystal Palace. We snuck in for the last day for sixth spot and beat West Ham in the play-off final. "It can be done but Palace was a long time ago. It's not against the realms (of possibility)." "After working so hard to get back in it we made the criminal mistake of falling asleep thinking you have done your job and conceded. "There's some good footballers in our squad. But if you don't take chances then you are liable to concede. At this level you have to be clinical when on top. "We are a side that can compete at this level and we have shown that." Match ends, Fulham 3, Huddersfield Town 1. Second Half ends, Fulham 3, Huddersfield Town 1. Attempt blocked. Jacob Butterfield (Huddersfield Town) right footed shot from outside the box is blocked. Assisted by Tommy Smith. Attempt blocked. Grant Holt (Huddersfield Town) right footed shot from outside the box is blocked. Thomas Eisfeld (Fulham) wins a free kick in the defensive half. Corner, Huddersfield Town. Conceded by Konstantinos Stafylidis. Attempt missed. Hugo Rodallega (Fulham) right footed shot from the centre of the box is too high. Assisted by Thomas Eisfeld with a cross. Goal! Fulham 3, Huddersfield Town 1. Ross McCormack (Fulham) right footed shot from outside the box to the top left corner. Assisted by Hugo Rodallega. Substitution, Huddersfield Town. Danny Ward replaces Paul Dixon. Corner, Huddersfield Town. Conceded by Elsad Zverotic. Attempt missed. Hugo Rodallega (Fulham) right footed shot from the centre of the box is too high. Assisted by Bryan Ruiz with a headed pass. Corner, Huddersfield Town. Conceded by Bryan Ruiz. Nahki Wells (Huddersfield Town) wins a free kick on the right wing. Goal! Fulham 2, Huddersfield Town 1. Lasse Vigen Christensen (Fulham) right footed shot from the centre of the box to the bottom right corner. Assisted by Hugo Rodallega. Goal! Fulham 1, Huddersfield Town 1. Joel Lynch (Huddersfield Town) header from the centre of the box to the centre of the goal. Assisted by Paul Dixon with a cross following a set piece situation. Elsad Zverotic (Fulham) is shown the yellow card for a bad foul. Corner, Fulham. Conceded by Sean Scannell. Attempt saved. Lasse Vigen Christensen (Fulham) right footed shot from outside the box is saved in the centre of the goal. Assisted by Ross McCormack. Substitution, Huddersfield Town. Nahki Wells replaces Jonathan Hogg. Substitution, Fulham. Moussa Dembele replaces George Williams. Attempt missed. Hugo Rodallega (Fulham) header from the centre of the box is close, but misses to the left. Assisted by Ross McCormack following a set piece situation. Hugo Rodallega (Fulham) wins a free kick on the left wing. Attempt missed. Grant Holt (Huddersfield Town) left footed shot from very close range is just a bit too high. Assisted by Paul Dixon with a cross following a set piece situation. Attempt blocked. Ross McCormack (Fulham) left footed shot from outside the box is blocked. Assisted by George Williams. Attempt missed. Harry Bunn (Huddersfield Town) left footed shot from the left side of the box misses to the right. Assisted by Jacob Butterfield.